A true team player, Danny is always willing to help anyway he can. 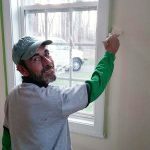 Danny comes from many years of experience in deck staining, drywall repair, Interior and exterior painting. He takes his time with everything he does because workmanship and paying attention to every detail, no matter how small is important to Danny.